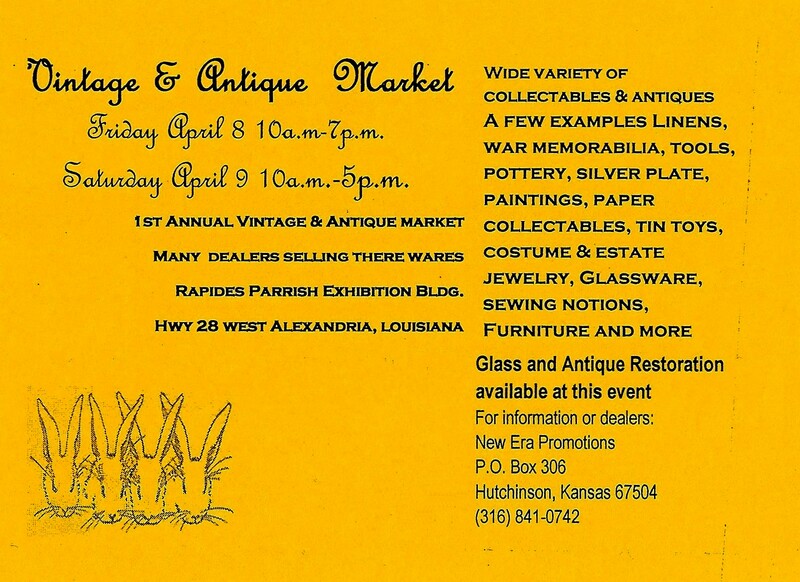 Antique Show in CENLA!!! April 8 and 9! There will also be a showing of our local vendors with their goods for perusal and sale. Please support this event! Coughlin-Saunders Performing Arts Center. 3pm. Talented Ventriliquist/Comedian Lynn Trefzger will be there and a tea and puppet crafts will conspire in the lobby. The admission is $5 a person, or $20 for groups. Call 443-4718 for more information. 6-9pm. Features knwn and new art and artists. Live music, contemporary and traditional art on display. Admission is free. North Levee Park, Fri 5-10pm and Saturday 12-10pm, Sponsored by the City of Alexandria. Championship barbecue, music and a carnival. Admission is $10. Call 449-5225 for more information. Well, even though this is bad timing for this event, I am including it because I think it is a cool idea and that Vivian would really dig it. TREE House and the Martin Foundation is sponsoring a petting zoo for children 1-3pm. Cost is $4 per person, children under 2 are free. Call Kara for more information: 619-9394. Great things are going on in Cenla! Hope to see you at one of these events. Click on this link: ﻿FACEBOOK it will redirect you to Ford’s Facebook page. This link will bring you directly to Love Without Boundaries video. Click on “LOVE IT”. Every vote counts! You can click on it every day until December 31st if you wish. LWB’s formula budget in their orphanges are $100,000.00. This $10,000.00 grant would be a huge blessing to them! Gyro Salad with Apollo Dressing, side of Grecian Dip...good stuff! I love mediterranean/mid eastern food. Apollo is out of this world! You definitely have to like and understand the culture in order to eat there. 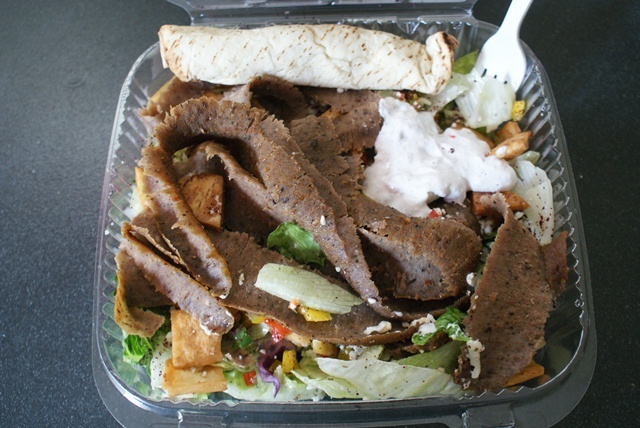 I love their salads…the Gyro salad with the Apollo dressing is the best. The chicken schwarma is an awesome choice too! If you love gyros and Greek food, you definitely have to give this place some of your business. I plan on trying my best to eat there as often as possible. We need more places like this. I am tired of the run of the mill chains. Let’s keep these people in business! I read a lot of ignorant things said in reviews about this restaurant most of it had to do with the culture or the ethnicity of the owners and NOT anything to do with the food. This makes no sense to me at all. The owners are very kind and I have had great service, with the exception of one blonde, very rude waitress who could not even pronounce gyro (yee-roh…yee-roh say it with me people yee-roh) correctly and then she proceeded to tell me that what I was ordering was not really what I wanted. That’s interesting…I had ordered it several times before, I am so glad she can read my mind. However, the owner came out and saw what was going on and recognized me and quickly took my order. Unfortunately, you will run in to people like that anywhere. So, I have no complaints. The food is awesome! As far as listening to the different music and the TV being tuned in to a middle eastern channel….uh…you are at a middleastern restaurant. Do I really need to say more? Enjoy your experience and enjoy the good food. The next thing we can work on is getting Whole Foods to open up a store….now wouldn’t that be something? 1. Our numeral system (0, 1, 2, 3, etc.) are Arabic numerals. This numbering system we use today, originally developed in India, was taught to Europeans and in the Americas by Arabs from North Africa. Thus, the name Arab numerals. 2. Lebanon is called the “Paris of the Middle East”. Lebanon was under French Mandate until their independence in 1943. The official language is Arabic and French. It is bordered by Israel to the South and Syria to the North and East. It is a very popular tourist area due to its mountains and beaches. 3. Beirut is the largest city and capitol of Lebanon with a population of 1-2 million people. Beirut is named one of the ten most livelist cities in the world. I thought this was neat. This was sent to me this morning. Thought I would repost. It is neat to visit the museum. Anyone who has not visited, it would be well worth your while and best of all — it’s free! My favorite time to go is when relatives come in. We make a round to the Kent House and the Museum, as well as other cool things. “The photograph you are looking at is part of the core history of the Hotel Bentley. 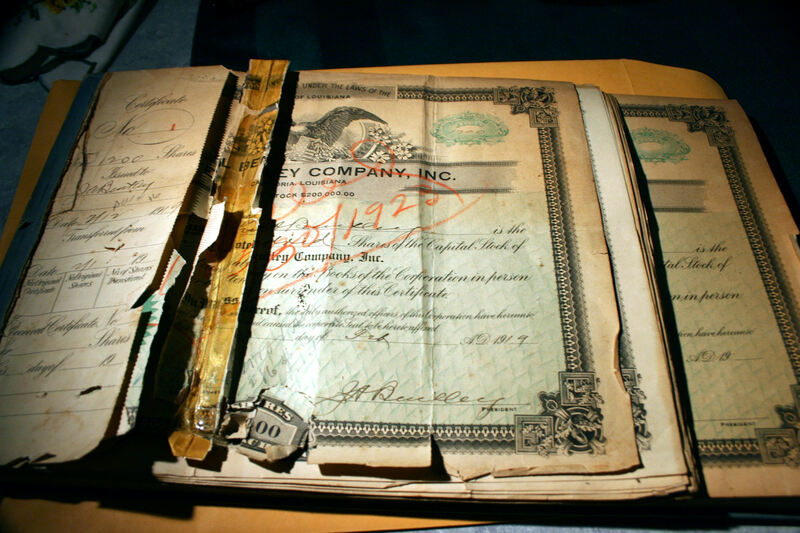 It is the Hotel Bentley Corporation Stock book. It has surfaced after spending almost 60 years in a box in the back of a closet, in Houston, Texas. It records the investors in the Hotel Bentley from 1919 to 1936. The names of the local businessmen who thought enough about Alexandria to invest their hard earned money in the Bentley.